Tralee Parnell’s hurlers made the step up to adult competition on Friday evening last against Lixnaw in Round 1 of the North Kerry Intermediate Hurling League. The game was played at Hermitage Park, Lixnaw where the host club marked the historic occasion with their Chairman, Mike Kelliher, presenting a commemorative plaque to the Parnell’s Chairman, Dermot Reen. On the field however Lixnaw had the upper hand, winning by 1 - 15 to 0 - 10 but Parnell’s can be well satisfied with their display. For the record the Tralee Parnell’s lineout was: Robin Porter, Ciarán Murray, Ciarán Breen, Johnny Downey, Eoghan McKivergan, Tadhg Brick (capt. ), Andrew Morrissey, Barry Lyons, Cathal Dunne, Paul Daly, Cillian O’Riordan, Daniel Teahan, Ronan Gilsenan, Mark Ryall, Danny Maguire, Martin Savage, Tom Crowley, Damien Kissane, Ian Moynihan. Manager - Brian Shanahan. Other NK IHL Round 1 results: St. Brendan’s 2 - 16 Kilmoyley 0 - 13; Abbeydorney 0 - 14 Lady’s Walk 1 - 11 [draw]; Crotta 1 - 18 Ballyheigue 2 - 6. Parnell’s will have their first home game in the same competition on this Friday when they host St. Brendan’s at Caherslee, 6.45p.m. Other Round 2 fixtures are Causeway v Kilmoyley; Lady's Walk v Crotta and Ballyheigue v Abbeydorney. Lee Strand Co. Under 12 hurling league Round 2 results. Division 1 - Kenmare /Kilgarvan 4 - 7 Ballyduff 0 - 1; Tralee Parnell's 4 - 11 Ballyheigue 3 - 4. Division 2 - Kilmoyley 4 -7 Abbeydorney 1 - 4; St Pats/ Dr. Crokes 4 - 6 Rathmore 0 - 6; Kenmare/Kilgarvan B 2 - 1 Lixnaw 5 - 10. Division 3 - Ballyduff 5 - 12 Kenmare/Kilgarvan C 2 - 3; Causeway 5 - 7 Crotta B 1 - 0. Round 3 fixtures for this Friday, 12 April, 7.00p.m. Division 1 – Ballyheigue v Crotta; Tralee Parnell’s v Kenmare/Kilgarvan; Ballyduff v bye. Division 2 – Kenmare/Kilgarvan B v Kilmoyley; St. Pat’s/Dr. Crokes v Firies; Abbeydorney v Rathmore; Lixnaw v St. Brendan’s. Division 3 – Ballyduff B v Causeway; Tralee Parnell’s B v Kenmare/Kilgarvan C.
Lee Strand Co. Under 16 League results: Division 1 - St. Brendan’s 4 - 14 Ballyheigue 2 - 11; Kenmare/Kilgarvan 2 - 9 Ballyduff 0 - 9. Division 2 - South Kerry 0 - 6 Abbeydorney 4 - 11; Tralee Parnell's 3 - 11 Kilmoyley 0 - 9; Crotta 4 - 9 Lixnaw 3 - 5; Tralee Parnell’s 6 - 8 Lixnaw 2 – 11. Round 4 is on this Thursday, 11 April, 7.00p.m. Division 1 - Kenmare/Kilgarvan v Ballyheigue; St. Brendan’s v Ballyduff. 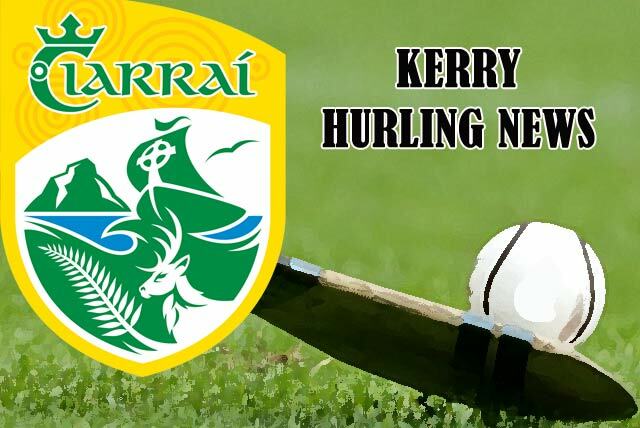 Division 2 – Kilmoyley v South Kerry; Tralee Parnell's v Crotta; Abbeydorney v Lixnaw. Lee Strand Co. Under 14 hurling league Round 1 results: Division 1 - St. Brendan’s 4 - 10 Lixnaw 0 - 3; Kenmare/Kilgarvan 3 - 7 Tralee Parnell’s 2 - 2. Division 2 – South Kerry 2 - 9 Ballyheigue 1 – 4. Round 2 is on this Saturday, 13 April, 5.00p.m. Division 1 - St. Brendan’s v Crotta; Tralee Parnell’s v Lixnaw; Kenmare/Kilgarvan v Ballyduff. Division 2 – Ballyheigue v Kilmoyley; Abbeydorney v South Kerry; Causeway v Firies. The North Kerry Minor Hurling Leagues will get underway on this Sunday, 14 April with all games at 11.00a.m. Round 1 fixtures are: Group 1 - Abbeydorney v St. Brendan's; Causeway/Kilmoyley v Crotta O'Neill's; Group 2 - Lixnaw v Ballyheigue; Tralee Parnell's v Ballyduff. The 2019 Kellogg’s GAA Cúl Camps for Hurling in Kerry will take place as follows: Ardfert & Rathmore (1 – 5 July), Lixnaw & Ballyduff (8 - 12 July); Ballyheigue & Kenmare (15 - 19 July); Causeway & Fitzgerald Stadium, Killarney (22 - 26 July); Abbeydorney (29 July – 2 August); Crotta O’Neill’s – Dromakee (5 – 9 August) and Kilmoyley & Tralee Parnell’s - Caherslee (12 – 16 August). Cost remains at €60 per child with reductions for additional members of families. Kellogg's GAA Cúl Camps are open to children between the ages of 6 to 13. The hours of the camps are 10.00 am to 2.30pm. and note that from this year booking will not be accepted on the first day of any camp. Register at www.gaa.ie/kelloggsculcamps The Online Booking facility closes at noon on the Friday preceding the week of the camps. Kellogg’s GAA Cúl Camp gear (including a jersey, training top and backpack are included in the cost of the camp.